Ladies and gentlemen, this post is a warning. A warning of a plot against us, fellow gamers. It is a plan so sinister, the conspirators had to cover it underneath an innocent, fun trading card game. A conspiracy that is out to get us, my loyal readers. The name of it? 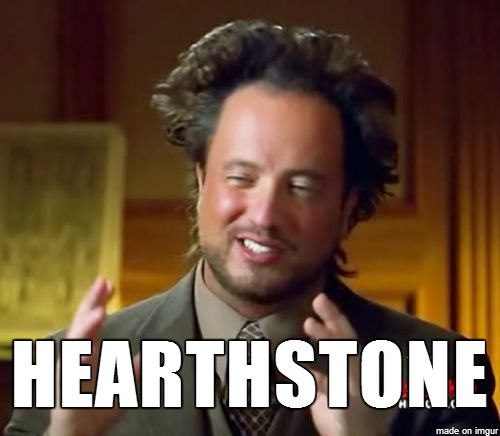 Hearthstone. Honestly, did you believe that Blizzard would simply publish a harmless, free-to-play strategy game out of love for the franchise and the people who grew up with it? Do you think they would simply allow you to play a game, reminiscing about the times of Reign of Chaos and The Burning Crusade? Clearly, you were not prepared for their true plan. Once you have drowned yourself in the TCG madness of Hearthstone, surrounded by sounds that seem so familiar, something will awake in you. The digital sorcerers from Irvine, California have hidden an invocation in the code, calling out to the buried nostalgia and latent need to be in Azeroth. Before you know it, you will renew your subscription and find yourself once more in Ironforge, asking yourself how you got there. Make no mistake, brothers and sisters. Some have already fallen, while others are still resisting the spell woven into Hearthstone’s virtual fabric. I came here, on this soapbox of mine, to stand with you against this temptation. Be strong, my brethren, and do not give into temptation! What you hope to find in WoW will not be there. The world has changed, and is no longer the place you remember. All you will find are broken memories and nostalgic thoughts, haunting you in every corner of a world you once called home. Keep to the card-game variety of Azeroth, and you will be fine! Be strong, my friends, and listen to your voice of reason just like I do. I stand here, unwavering, not renewing my subscription. Never mind the download of the client in the background, for that is just a trick to– oh who the hell am I kidding?! See you in Azeroth. GG, Blizz. I may try it once it is out, but I have trouble getting excited for Blizzard games. Everything post The Burning Crusade has soured me tremendously. I will once it is live. No will to seek it out!